Showing results for tags 'enp'. The Park Service has a contractor in the park installing new channel markers from Florida Bay to the 10,000 Islands over the next few months. Work is underway in Tin Can Channel and Jimmy's Lake. The Park Service says that while channels will remain open during the work, boaters should use caution as they near the channels and be on the lookout for workboats. Next up will be Snake Bight Channel and Murray-Clive Key Channel. For those of you who use Florida Marine Tracks, Glen Housman told me that he will be out there taking a look in May/June. Whatever changes he finds will be represented by July. If the damaged/missing markers are replaced with new ones in the exact same location, no changes to the software will be needed. Launched Captain Tom's Master Angler out front at Flamingo at first light. High tide was at 7:37 a.m. so we would have falling water all morning. It was slick calm with mostly clear skies and no wind. We fished one of the keys near Flamingo, using mostly live shrimp on jig heads, though I did toss a twitch bait some and threw some soft plastics on a keel weighted, weedless hook under the mangrove over hangs. We spent most of the morning there, and then moved up into the East Cape area and Lake Ingraham to fish the last of the falling tide. We planned to be off the water by 3:00, and headed back to Flamingo around 2:30. We found the triple tail in Florida Bay, with five of them hanging under a floating tree limb (kind of like dolphin fishing offshore!). Unfortunately, Tom had some engine issues so we had to get a tow back to the marina. Thanks to the two guys in the Hewes that helped, and to Tom's two friends from Merritt's who towed us most of the way back. For the day, we caught over 30 reds, mostly rat-sized; a dozen snook including two slot size and one really big girl that jumped once and cut me off; grouper; black drum; trout; mangrove snapper; triple tail; jacks; ladyfish and a couple of catfish. Here are a few pictures from the day. First time on the water in 2019. InTheSlot12 (Mike) and I launched his Maverick HPX-18 from OR before first light. Weatherman was asleep at the wheel again--brisk winds from the NW blowing in the mild front that was on its way, overcast skies and cool. Outgoing tide until the tide change at about 9:10 a.m. with a negative low on the new moon. We had 10-12 small to slot size reds in the boat before the sun came up good over the east side of Chokoloskee Bay. Moving to some of the points on the rivers, creeks and bays on the inside, we both closed out the inshore slam by about 10:30. Most of the snook were small, but we caught some really nice trout. During the course of the day, we also brought snapper, grouper, jacks, sheepshead, ladyfish and of course a sail cat or two to the boat! Most of the fish were caught on live shrimp on jig heads or soft plastics--paddle tails and jerk shads. Took my long time friend Captain Tom Ross out on his new-to-him Maverick Master Angler to show Tom and his son Mike around the Park. We launched from Kon Tiki and ran to the NW. Early morning Tarpon in the shallow flats around Rabbit Key, but could not entice them to eat. Blue Bank and West Springer were holding some trout but not like usual. Interesting that we caught Spanish Mac's and Blue Fish while targeting the trout on soft plastics. Everything seemed to like white or white/pink. Ran to the Cape and fished the end of the incoming in some of the creeks where we had a couple of Tarpon in the air, but none to the boat. Found a few snook cruising the shorelines on the outgoing and managed to bring a couple to the boat. Ended the day covered up in Tarpon as the tide fell. Overall a really nice day with a good old friend and his son. Took a weekday off to take my old friend Captain Tom Ross out to Chokoloskee to fish the ENP and the 10K Islands. Tom is currently running a 74' Merritt for an owner out of Annapolis, but the boat is in the yard for some work through the end of the year. I recently helped Tom find a 2003 Maverick Master Angler that he is really enjoying. Some of you may have met Tom and his lovely wife Ann at the MOT. 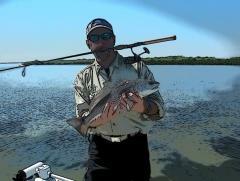 Tom is an accomplished blue water captain and pretty handy at the inshore stuff too! Weather report was favorable; the tides were big with the new moon but a little less favorable (8:19 a.m. low at Chatham River) as I tend to favor a falling tide in that area. We launched at OR at first light and ran south. Fishing primarily with soft plastics (Zman jerk baits in black and gold or Slayer or Down South paddle tails in several different colors; MirrOlure Lil John's in Watermellon Ice), we really got into the snook and trout but had trouble finding reds or tarpon. The snook were on the smaller side except for two slot sized fish that Tom brought to the boat. We got into some really nice trout on the low tide in a channel that runs parallel to a key. Over all, a great day with a good old friend in a magical place. InTheSlot12 (Mike) and I fished his beautiful 18' HPX-V on Sunday, leaving the marina at Flamingo at first light. It was windy with temperatures in the high 40's to low 50's. Water temperatures were in the low 50's as well. But, there was a warming trend and favorable tides--high at East Cape was around 5:30 a.m. The forecast was for clear skies and a high of almost 70 degrees. We were hopeful the fish would be ready to eat after last week's cold snap. Although I am primarily an artificial bait fisherman, we figured the shrimp would be big and hearty so we stopped at Don's and filled the bait well. We thought the snook would be in the deeper canals, creeks and rivers in the East Cape area, holding in structure on the down current side on that falling tide. What a great day! We brought between 25-30 snook to the boat--most slot size, a few smaller and 3 or 4 that were over slot. All of the fish were bright and shiny silver, fat and healthy and all were carefully handled and safely released. It's great to see the snook population in such good shape. We also had a nice black drum and a big (for Flamingo) trout. Overall, a great day. Here are a few pictures of the snook we caught, almost all with shrimp on jig heads. Just beautiful fish. There were also some HUGE crocks enjoying the sunny day!